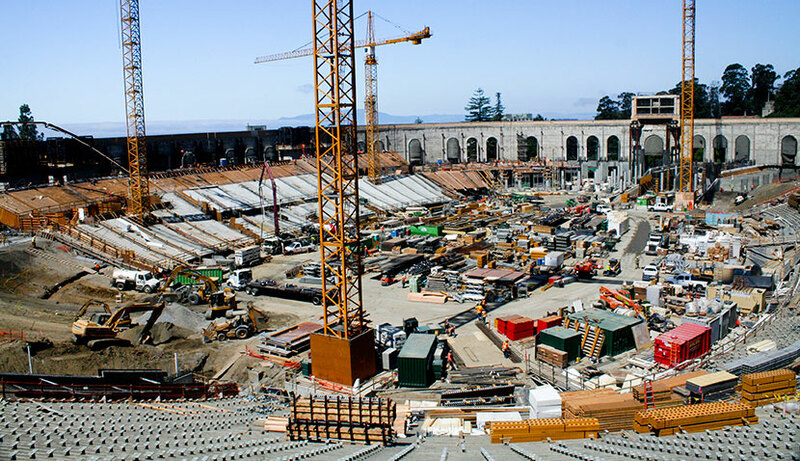 A massive renovation project on the University of California, Berkeley campus brought the historic California Memorial Stadium up to modern standards. Built in 1923, the aging facility required renovations and a seismic retrofit to reduce seismic risk while maintaining the architecture and character of the celebrated structure. The $321-million project included massive amounts of concrete formed with high and medium density overlaid plywood. The new 504,000-square-foot library in San Diego, California features a concrete gravity arch that is 46-feet tall, 70-feet wide at the base, and tapers to 37-feet wide at the top, with a total volume of 194 cubic yards. Built in three lifts utilizing a combination of Peri Vario wall forms, GRV radius forms, and multi-flex shoring, the soaring arch supports each of the 4th through 8th floor slabs directly above it. To create the quilted random plywood pattern, contractor Morley Construction coordinated every seam and tie location. All of the 232 plywood panels were precut, numbered, and organized in order of assembly, and finally installed on the forms in the order and orientation specified on the concrete shop drawings. All column, wall, and beam forms were double-sheeted with 3/4-inch plywood substrates and 3/4-inch plywood with a film fascia. 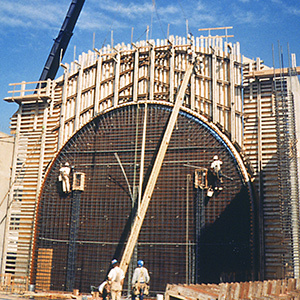 All column forms and most other architectural formwork were back-screwed, mitred whenever possible, and installed with a minimal use of ties (5-foot spacing vertically, and 4-foot spacing horizontally). 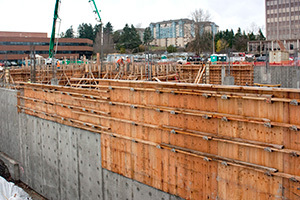 When Rush Commercial began construction of the Pacifica Apartments in Tacoma, Washington, affordability was a primary factor in concrete forming product selection. The two-building, 230,000-square-foot apartment complex featured 177 units, two underground parking garages, and required 7,000 yards of structural concrete – including five post-tensioned reinforced concrete decks with up to 800 cubic yards of concrete in each. It wasn't unfamiliar territory for the Washington State developer-contractor, which has built, owns and leases over one million square feet of commercial office space and 1,700 multi-family units. 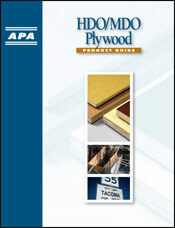 Rush Commercial selected 3/4-inch MDO (Medium Density Overlay) plywood for the concrete formwork. 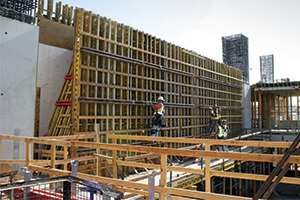 Superintendent Bob Bowman says key considerations were cost-effectiveness and how easily the panels could be to cut to size for use as fill-in formwork. "There were many steps in the wall elevations and many different column block-outs on the exterior walls," says Bowman. 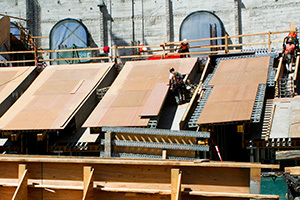 "Wood panels were the most cost effective for the formwork because we could cut and modify the panels to fit as needed. Then (after the concrete was poured) we would cut and modify the panels again to use in others areas." A dramatic series of eleven, 55-foot-high reinforced concrete arches accentuate the façade of the Washington State History Museum. Built on a prominent site in Tacoma, Wash., the building is adjacent to the Union Station, a former railroad station, built in 1911. The goal of the Washington State Historical Society was to construct a world class facility, while maintaining the historic architecture of the former railroad station. The construction team built a 6,800-square-foot gang form composed of APA trademarked HDO plywood panels to form a single arch. Over 4,000 sheets of HDO plywood were used to create sections of gang forms. Panels were reused seven times while pouring the other arches. HDO plywood panels, like the ones used in constructing the gang forms for the History Museum, have a hard, slick, semi-opaque surface of thermoset, resin-impregnated material that forms a durable, continuous bond with the plywood. Read more about this project in the APA Case Study: Washington State Historical Museum, Form W115, available for free download in PDF format.